This CD is an interesting concept. 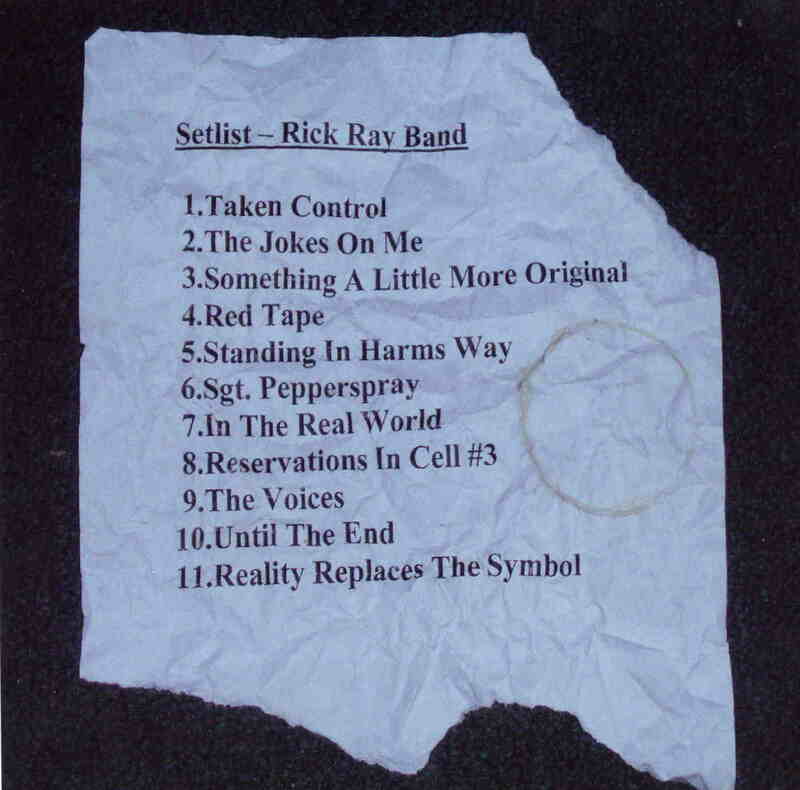 If I get it right, the band decided a setlist like they would for a concert and then books a day in the studio and rock out as if it was a concert and release it. This was performed at Studio G on 4/9/09 but mixed at the bands own studio and you will recognize the sound. I have never really liked the sound on the CDs but you sort of get used to it after a few songs and can start to appreciate what they try to achieve Anyway, this .probably took them some time to mix it but I get this was live with no overdubs.. Cool. Anyway, this features tracks as old as the 70’s as well as from the most recent record Violence Marred by Peace (a really good record). Taken Control kicks things off in a hard rocking way like you would like a concert! He plays a great guitar solo to start things off as well. The Jokes on Me, more prominently features Rick Shultz on reed instruments. Something a little more Original is a pretty complicated instrumental number with a lot of complex playing showing the skills of this band. Red Tape starts off with a guitar solo and then it takes off in a fast pace rock track but still quite melodic with a nice sax line. Standing in Harm’s way from the Nothing to Lose CD is next and is like an old school 50’s rock song in some way. Cool song to mix it up. The excellent Sgt. Pepperspray from Violence Marred by Peace is next. This is a really great track with cool guitar and sax. Great interplay. In the Real World is another complicated track to that starts with some intense drumming and guitar playing to start things off before a more melodic section but then it comes back. Great stuff and difficult to play! Reservations in Cell #3 has some intense lyrics and is a bit of a dark track. The Voices has a wah wah guitar to change things up and reminds me of some other band, the main riff... who?? Until the End from Temporary World, is next and is a song to make a statement! Reality replaces the Symbol ends this in the studio concert. I really appreciate that Rick is able to use music as a vehicle to speak up about politics as most bands write about banal subjects. Rick takes on serious stuff and delivers some great music to go along. Support this man and his band.